The first time you play a card each turn, draw a random card from your deck with cost equal to your remaining magicka. 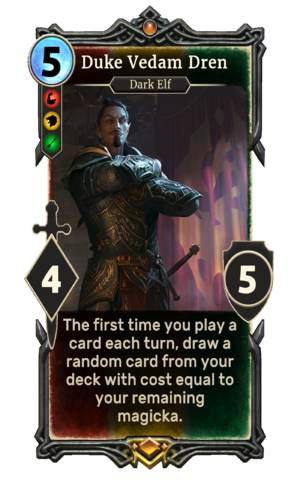 Duke Vedam Dren is a unique legendary House Hlaalu creature card. It is part of the Houses of Morrowind expansion. "We must help the people of Vvardenfell." "If they're determined to be an enemy..."
The card previously had 4 health, but this was increased in patch 1.72.4. "Don't make enemies. If someone is determined to be your enemy, then fight. But do not turn friends or potential friends into enemies through arrogance or carelessness." "Use your rank and influence to help the people of Vvardenfell." This page was last modified on 2 March 2019, at 00:47.